Second Time's the Charm is now available- With New Scenes~! What if your soul mate was your best friend's ex-husband? she has thrown herself into her children and job. An emergency life threatening illness of her best friend's son puts her on the path to romance. Lissa finds her new love in an unexpected way...introduced by his ex-wife. 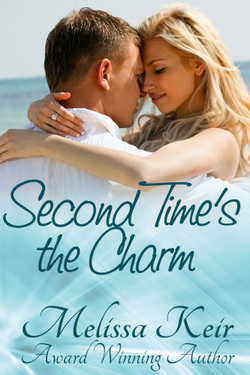 Who knew that first time loves could lead to second chances? Dressing for another long day as a receptionist at a local pediatrician’s office, I went to rouse my children. There's something profound about watching your child sleep. Not wanting to wake them but knowing that our time in the morning is limited before work and school, I playfully mussed the boys’ hair and called their names. As the boys wiped the dreams from their eyes, I smiled and watched them come aware of the world around them. Their little furrowed brows showed they had to adjust to which house they were in. With Steve’s house being the home they grew up in and my apartment being smaller, they were shuttled back and forth each week so we both got a chance to be parents. That was important to both of us. Neither Steve nor I wanted to live without our children. I was lucky. The kids came first in our lives and wanted for nothing. We had done something right, even though we could hardly talk to each other without fighting. The morning routine over, I arrived at the office and set about getting ready for a day filled with sick, screaming children, frustrated parents, and a gallon of hand-sanitizer. Never failing to disappoint, the phone began ringing off the hook around eight o’clock. “You aren’t supposed to be noticing cute guys,” I teased. “Oh, Mike was there and you can’t have him. But there were other hot guys.” Chloe and Mike met when her own marriage ended. Mike had been her cooking teacher at a local community college class. Chloe decided culinary skills would improve her marriageability. And while the class did nothing to improve her cooking, it did land her Mike’s heart. 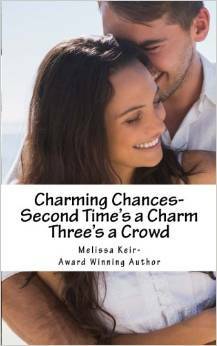 Second Time's a Charm is now available with its sequel Three's a Crowd in print!